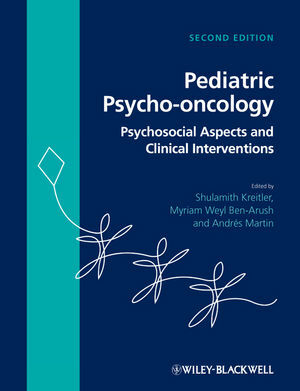 Like the ground-breaking first edition, Pediatric Psycho-oncology, Second edition puts the child at the centre of medical and psychological care. It broadens the focus beyond treatment and cure to consider the quality of life of the child and their family. Written by an international group of pediatric oncologists and psychologists/psycho-oncologists brought together by an expert editorial team, it focuses on the real-life practical aspects of children undergoing treatment for cancer. This edition has been restructured and opens with a major section on Active treatment, which includes chapters addressing quality of life, pain, psychosocial aspects of treatment and interventions, art therapy and different fantasy-based techniques, palliative care, communication and education, as well as a new chapter on psychopharmacology. Shorter sections then discuss survivorship and care of the dying child, including a new chapter on bereavement. The final section comprises new chapters on ethical considerations and on addressing the emotional needs of children whose parents have cancer, as well as a case study on international collaboration. An appendix provides a comprehensive overview of tools for evaluation and assessment in pediatric psychooncology. This book is a highly practical resource that will be invaluable for all health care professionals looking after children and adolescents with cancer. Dr Shulamith Kreitler studied psychology, philosophy and psychopathology in Israel, Switzerland and the USA. She studied for her PhD at the University of Bern, Switzerland and is a certified clinical and health psychologist. She has been Professor of Psychology at the Universities of Harvard, Princeton and Yale in the USA, Buenos Aires, Argentina and Vienna, Austria. Since 1986 she has been Professor of Psychology at Tel-Aviv University and currently also teaches at the University of Haifa. She is Head of the Psychooncology Research Center at Sheba Medical Center, Tel Hashomer, Israel. She has published about 200 papers and 10 books on motivation, cognition, psychopathology and health psychology, and is known especially for her work in health psychology, particularly psychooncology, the theory of meaning, and the cognitive orientation theory for the prediction and change of behavior. Dr Myriam Ben-Arush is Associate Professor in Pediatrics at the Technion Faculty of Medicine, Director of the Pediatric Hematology Oncology Department, Rambam Health Care Campus, and Deputy Director of the Meyer Children's Hospital, Rambam Health Care Campus, Haifa, Israel. She is past Chair of the Israel Society of Pediatric Hematology Oncology, and received a bursary from the Israel Society of Oncology for the creation of the Pediatric Oncology Unit in Northern Israel. The World Medical Association recognised her as ‘Caring Physician of the World’, and she is ‘Chevalier de la Légion d’Honneur’. Dr Ben-Aurush is Associate Editor of the Journal of Pediatric Hematology Oncology, a member of the National Council of Oncology and Pediatric Health and of the Israel Cancer Association. She sits on the Research Committee of the Israeli Ministry of Health and the advisory committee for treatment outside Israel. She is also a Principal investigator in Israel of the European Soft Tissue Sarcoma Protocol. Dr. Andres Martin is the Riva Ariella Ritvo Professor of Pediatric Oncology Psychosocial Services at the Child Study Center, Yale School of Medicine. He is the consulting psychiatrist to the Section of Pediatric Oncology of the Children’s Hospital and the Smilow Cancer Hospital at Yale-New Haven, where he also co-leads the Parenting At a Challenging Time (PACT) program. Dr. Martin is editor-in-chief of the Journal of the American Academy of Child and Adolescent Psychiatry, and co-editor of ‘Pediatric Psychopharmacology: Principles and Practice, 2nd edition’ and ‘Lewis’s Child and Adolescent Psychiatry: A Comprehensive Textbook, 4th edition’.